Mohammed Danyaal has been in great form for Peterborough Town. Peterborough Town’s form is coming to the boil just in time to tackle some of the Northants Premier Division’s biggest hitters. Town delivered their best all-round performance of the campaign to demolish Horton House by 143 runs last weekend. Joe Dawborn is searching for his best Peterborough Town form. That was a third win in four matches for the city side who are level on points at the top with Old Northamptonians ahead of tomorrow’s (May 21) clash with Brixworth at Bretton Gate (noon). Town will start warm favourites to win that one, but then they face a tough run of games against the likes of Rushden, ONs, Finedon and Rushton. Clarke, who cracked a classy run-a-ball ton against Horton, said: “We played very well last weekend. “It was the most complete performance of the season by a long way. “All the batsmen have now scored runs, while Lewis Bruce, Danny Mohammed and Jamie Smith have been among the wickets. “Joe Dawborn has been short of his best form so far, but he is working hard to overcome the fact that he didn’t play in the winter for the first time in years. Market Deeping can go clear at the top in the Lincs Premier Division with a positive result at Nettleham tomorrow. Deeping are currently level on points at the top with Grantham. Bourne are fifth, but just eight points behind Deeping. Bourne travel to Grimsby tomorrow. Pick of the Cambs Division One matches tomorrow sees Wisbech host title favourites Saffron Walden at Harecroft Road (12.30pm). The quarter-finals of the Stamford Charity Cup, a Twenty/20 competition, take place on Monday (May 23). (noon): Premier Division: Finedon v Oundle, Peterborough Town v Brixworth. (1pm): Division One: Burton Latimer v Peterborough Town 2nds. (1pm): Division Three; Oundle 2nds v Heyford. (1pm): Division Eight: St Michael’s v Oundle 3rds. (noon): Grimsby v Bourne, Nettleham v Market Deeping. (12.30pm) Division One: Ketton v Godmanchester, Nassington v Blunham, Ramsey v Burwell 2nds, Wisbech v Saffron Walden. (12.30pm): Division Two: Granta 2nds v Newborough, Ufford Park v March. (1.30pm) Premier Division: Boston 2nds v Stamford, Bourne 2nds v Billingborough, Grantham 2nds v Spalding, Long Sutton v Woodhall Spa 2nds. (1.30pm): Division One: Bill’boro 2nds v Spalding 2nds, Moulton H v Skegness 2nds. (1.30pm): Division Two: Pinchbeck v Spalding 3rds. (1.30pm): League Cup: Baston v Long Sutton 2nds. 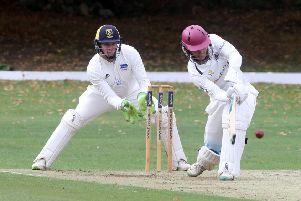 (1pm) Division One: Burghley Park v Castor, Stamford v Ramsey 2nds, Waresley 2nds v Hampton. (1pm) Division Two: AK 11 v Barnack, Blunham 2nds v Nassington 2nds, Orton Park v Buckden, Peterborough Town 3rds v Bharat Sports. (1pm) Division Three: Alconbury v Werrington, Hampton v Sawtry, Newborough 2nds v Upwood. (1pm) Division Four: Bretton v Brampton (at Barnack), Castor 2nds v G Staughton, Falcon v Ketton 2nds, Hemingford Park v Burghley Park 2nds, King’s Keys v Blunham 3rds. (1.30pm) Division One: Barnack v Bourne, Peterborough Town v Stamford, Ufford Park v Nassington, Wisbech v Oundle. (1.30pm) Division Two: Castor v Grantham, King’s Keys v Ketton, March v Newborough, Oakham v Uffington, Whittlesey v Medbourne. (1.30pm) Division Three: East Carlton v Bretton, Kettering v Burghley Park, Werrington v Wisbech. (1.30pm) Division Four: Isham v Orton Park, Nassington 2nds v Kimbolton, Ramsey v Easton. (1.30pm) Division Five: Alconbury v Peterborough Town, Benefield v Laxton, Market Deeping 2nds v Weldon, Sawtry v M Overton, Uppingham 2nds v Castor 2nds. (1.30pm) Division Six: Long Sutton 2nds v Newborough 2nds, Moulton Harrox 2nds v Ufford Park 2nds, Orton Park 2nds v Whittlesey 2nds, Spalding v Hampton 2nds, Uffington 2nds v Huntingdon. (1pm) Division Five: Houghton & Wyton v Sheikh 11. (6pm) Quarter-finals: Bourne v Ufford Park, Burghley Park v Barnack, Castor v Ketton, Market Deeping v Uffington. (6pm) group matches: Nassington v Oundle, Market Deeping v Bourne, Castor v Barnack, Ramsey v March.